I rode the school bus almost every day when I was in school. Now, through Kindergarten to 8th grade, suffering the bus ride to and from school was an accepted fact of life for almost all kids I knew. The grogginess of the morning commute. The panic of finding someone with whom to share a seat when the bus is over capacity. The hierarchy of seating (troublemakers in the back, goody-two-shoes in the front, undecided milquetoasts in the middle). You ride the bus as a matter of course and you deal with all the indignities because you don’t really have a choice. High school, and the independence which it affords, changes things. The popular and good looking begin figuring out the angles and hooking rides with older teenagers WITH CARS. The athletic and intelligent have demanding after school activities which would either put them on the “post sesson” bus (our high school’s term for the last bus to leave school for the day) or again, getting a ride with someone. I was neither popular nor good looking, not athletic or intelligent… so I continued to ride the school bus and it was hell. You can imagine what type of rider remained, after considering the numbers of teenagers who had found better options then taking the school bus. At the time, the bus seemed to me to be filled with delinquents whose idea of a good time consisted of burning interesting shapes into the backs of the bus seats with their lighters. Instead of trying to fit in with that crowd, I turned (as I often did, growing up) to books. Specifically, old paperbacks, caged from wherever I could find them. I read a LOT on the bus, both in the morning and in the afternoons… and that’s where I first read Ray Bradbury. It was The Illustrated Man I first encountered, the perfect school bus read. Most of the stories in The Illustrated Man were about the length of one full bus ride (morning AND afternoon together)… and they were freaky. I was never a big reader of science fiction novels as a teenager- then and now, I’m more a horror/mystery guy. 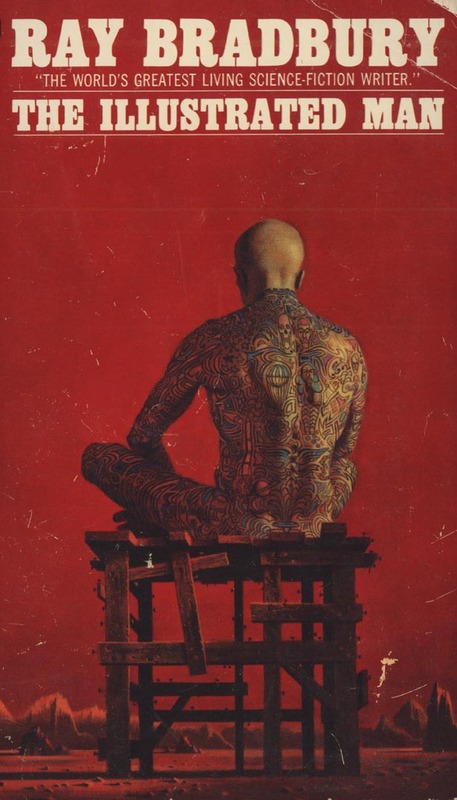 Those stories in The Illustrated Man… his writing was transformatory. I had never read a book like that before. The stories were a wonderful jumble of emotions and ideas. Bradbury went from vicious (The Veldt) to hopeful (The Man, The Other Foot), to hopeless (The Long Rain, The City) and the bat of an eye. My bus rides were thusly fantasically changed by the tone and tenor of whatever wild concept Mr. Bradbury had to offer on that particular morning. Of course, I went on from there; Fahrenheit 451, R is for Rocket, The Martian Chronicles, Something Wicked This Way Comes. I loved them all and could wax on about them for about as long as I’ve yammered about my problems riding the school bus here. It was The Illustrated Man that got me first. That’s the one that got me started. That’s the one that made those bus rides bearable. I’m far sadder about Mr. Bradbury’s death than I thought I would be for that reason. Even though The Illustrated Man was first published in 1951, he did a kid in 1994 a great favor by writing it. Writer and illustrator Maurice Sendak died today. He was 83 years old. I loved Sendak’s picture books as a kid, and I love them today. His scratchy, well-layered illustrations always seemed to have so much more depth than many of the other picture books I read. My boys are currently enraptured by Chicken Soup with Rice, one fourth of The Nutshell Library; they were gifted a copy of the book from a reader of these comics, many years ago. Obviously, the book Sendak will be most remembered for is Where the Wild Things Are, the riotous, game-changing picture book from the 1960’s. Where the Wild Things Are dared to feature an angry, almost unlikable protagonist in little Max. It seems almost commonplace today, but back in 1963, the image of Max running after the family dog with a fork was shocking. I’ve paid homage to Sendak often throughout the years with my comics, going all the way back to when I was continuously drawing journal comics about my personal life. Even there, I was processing my anger through the monster character… and I had quite a lot of anger! At the time, I was living with my parents, eking out an existence on substitute gigs. I was hopelessly in love with someone who wasn’t going to give me the time of day. My life was a shambles! Gradually however, my use of the monster shifted away from being a purely angry expression of my personality. Here, the character twisted somewhat to become more a harbinger for my anxieties… specifically, my anxieties about teaching. Here’s one I drew right before I had to go back to work after my first extended holiday break. I was teaching 8th grade in Brooklyn and flailing mightily. I look at those comics and I remember all those angry, anxious feelings intimately… but the funny thing is, I didn’t know I was drawing the monster for either of those purposes! I’ve never been really great at expressing my emotions; it’s one of those things that really limits me as a cartoonist/artist/whatever. I just knew that there was a small contingent of my readership who really liked it when I drew myself as a monster! It’s easy for me to see all those emotions now, but at the time… nope. Meeting Ellen and starting a family has mellowed those angry, anxious feelings quite a bit. 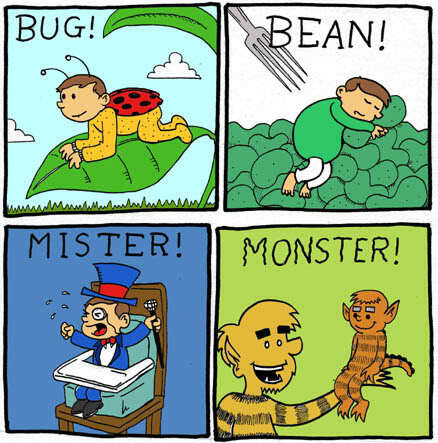 I started drawing a lot of comics where the monster was a hapless, sometimes even fun protagonist. There was this extended run of strips I posted about a few years ago. Then there’s this comic I did after Elliot was born, where I detailed all of our nicknames for the kid. 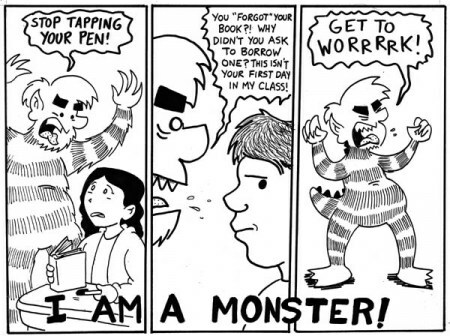 …of course, angry monster does come back from time to time. I quite like the idea of doing a comic strip where the main character is malleable and changes to suit the tone of the story. It’s something I considered pursuing awhile back. 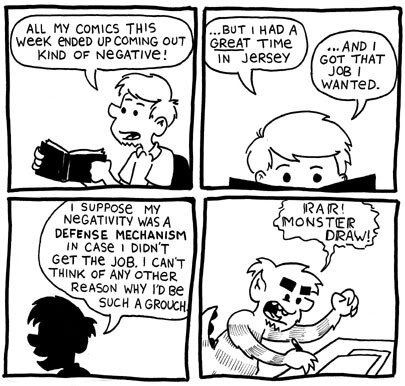 At any rate, I hope I’ve made it clear how very much Maurice Sendak means to me as an artist. The guy lived a long life full of every accolade and award an illustrator can hope to win; he produced work that will stand the test of time and journey on into the future as true classics. I’m sorry to lose him, but I’m glad to have known him through his art. No new Thrift Store Finds this week… but I did want to take a moment to note the passing of Bil Keane. I didn’t much like The Family Circus when I was growing up. I found it bland and boring, even when I was a little kid. I was lucky to grow up in the last great gasp of creativity and life in newspaper comics. Billy, Jeffy, and Dolly could not compete with Calvin, Hobbes, and Gary Larson’s cows. I read The Family Circus, I processed it… but I can never say I enjoyed it. When I started writing these weekly Thrift Store Finds, the very first book I looked at was a collection of Bil Keane’s lesser-known comic stirp, Channel Chuckles. I remarked at the time, having some small perspective on drawing my own comic strips, how impressed I was with Keane as a draftsman and designer. I think there’s a real talent to pulling off a one panel gag strip… and even in a silly comic like Channel Chuckles, it was clear that Keane knew what he was doing. 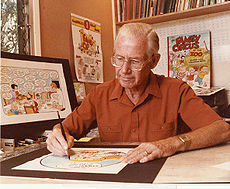 Later, I looked a couple of Family Circus paperbacks and I was again impressed with Keane’s work, crafting that small world into something millions of readers enjoyed everyday. There were, at least in the two paperbacks I looked at, far more details in Keane’s penwork than I remembered as a kid. Keane’s syndicate recently re-ran a parcel of “The Family Circus goes on vacation to Boston” comics I looked at in I’ll Shovel the Cards and I remain impressed with those strips. The cobble streets of Beacon Hill, the various touristy details of Boston all looked lovely, even when shrunk down to the size most newspapers run their comics. I was so intrigued by The Family Circus after this point that I picked up a couple of IDW’s Family Circus hardcover reprints, collecting the first four years of the comic. I was unexpectedly impressed by those comics, which paint a much grimmer picture of parenting than the modern Family Circus ever had. It’s clear that Keane always intended for heartwarming punny chuckles to be a part of his comic, but in the early years, he tempered those maudlin gags with some genuine commentary on parenting. The Daddy of the early strips was often seen taking a nip from a flask or ogling beautiful women, edgier fare than I had ever seen in newspapers when I was growing up. There are aspects of the strip that are cloying. The overt religious aspects of Keane’s life did encroach into the strip at times. Entire weeks could go by in The Family Circus without the comic approaching anything resembling an actual gag. I can’t deny any of that. Don’t think I’m arguing for The Family Circus to be included in the great works of mankind or anything. I was just surprised and pleased to find more to appreciate about his work when I started writing these weekly posts. …and I guess that’s what I wanted to say. In an odd way, I feel like I owe Bil Keane a debt, as he was the “road in” for me in beginning these Thrift Store Find posts. Most weeks here, I try to take something most people would think is worthless and reexamine that thing in an interesting way. Writing these TSF posst has made me a more thoughtful consumer of comics… and perhaps even a little better at drawing them. So thanks for that Bil. Rest in peace. I wrote about Channel Chuckles here. I wrote about I’ll Shovel the Cards: A Family Circus Collection here. I wrote about Peace Mommy Peace: A Family Circus collection here. It’s been a particularly busy weekend here at Casa de Pearce, so I don’t have any new sketchbook stuff to share with you. I did, however, want to take a minute to note the passing of a writer and author who influenced me greatly in the past few years. As a comics reader, I had been aware of Pekar’s comics for years before I actually read any of his work. I only jumped into the American Splendor pool when the 2003 movie came out and I picked up a couple of anthologies. I’ve been a regular reader ever since. After reading the short story, we discuss how Pekar was able to take a brief incident from his life that, for most people, might have gone wholly unremarked and turn it into a examination of himself and his own mortality. We dissect the comic panel by panel and even though I do the lesson year after year, I’m always floored by the shrewd and intelligent observations my ninth graders make about the piece, from the wording that the character uses, to the way that Pekar and Crumb use pauses in the monologue, right on through to the clothes and facial expressions that the Harvey character wears in certain panels. When the class has gone over that story thoroughly, I then give the students their first writing assignment. They are asked to write a short story titled “Who is _________” wherein they find a small moment from their own life, describe it, and somehow tie that moment into a statement about who they are as a person. It’s an interesting lesson to start the year off with, and it has a great rate of success insofar as it gives me a taste of who my students are. I don’t always get the most well-composed stories right off the bat… but I do get to see them engaging with their lives in a unique way, and that’s always a joy to see as an English teacher. I also feel this lesson sets a tone at the beginning of the year. I want my kids to understand that their lives are very important to me, even the dusty corners that may not even be of great interest to themselves. If that’s the only reason why I enjoyed Harvey Pekar’s work, I would probably have saved this post for a Friday Odds & Ends collection, but there’s another reason why I wanted to write about the guy, and it’s simply this. 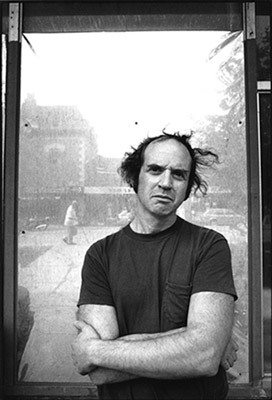 Harvey Pekar was a comic book writer. He wrote terrific comics that made people think and documented everyday life in 20th century America. He was also a file clerk at a veteran’s hospital for the better part of his life. His comics didn’t make him rich. They didn’t really make him famous in the way that other authors of his stature could be considered as such… his greatest fame probably came from his stint as Late Night with David Letterman‘s resident curmudgeon in the early 1980’s. I don’t know the man, nor am I some kind of authority on his work, but from what I’ve read of Pekar’s writing, he didn’t do it for recognition or fame. He did it because he was smart and he needed an outlet. He did it because he loved doing it. It didn’t pay the bills and it wasn’t ever going to… but he simply felt like he had something to say. I’ve always identified with that. If you’ve never read any of Harvey Pekar’s work, I highly recommend picking up American Splendor: The Life and Times of Harvey Pekar, a reprint of the author’s first two collections. Published in conjunction with the movie in ’03, they’re a good introduction to the type of work that Pekar regularly did. I’d also recommend some of his more recent work for the DC Comics’ Vertigo imprint, starting with The Quitter, a novel-length comic that serves as an “origin” story of sorts for Pekar, as well as Vertigo’s two American Splendor trades wherein Pekar works with a great variety of different illustrators. The Vertigo version of Splendor deserved a longer life than it received on comic book racks. So too did Harvey Pekar. Rest in peace man… but not TOO much in peace, if I’ve gotten to know you well enough from your years of writing. You are currently browsing the archives for the eulogy category.